National Rum Day is August 16. We’re celebrating with Bailey Pryor of The Real McCoy spirits company in Connecticut. 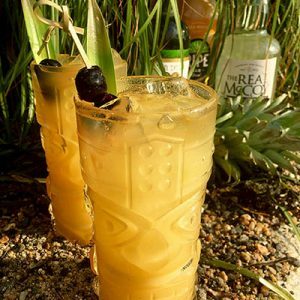 He’s invented a cocktail called “Faith in Tiki” and it’s delicious. Plus, more corn on the cob tips (because you can’t have too many), an affordable white wine from Italy, and the wildly entertaining and very talented Chef Rossi. A play based on her memoir The Raging Skillet is at TheaterWorks in Hartford right now. Get your tickets while you can. Also this week, Noah’s in Greenport, LI gets a shout-out. • “Feel It Still,” Portugal. The Man.